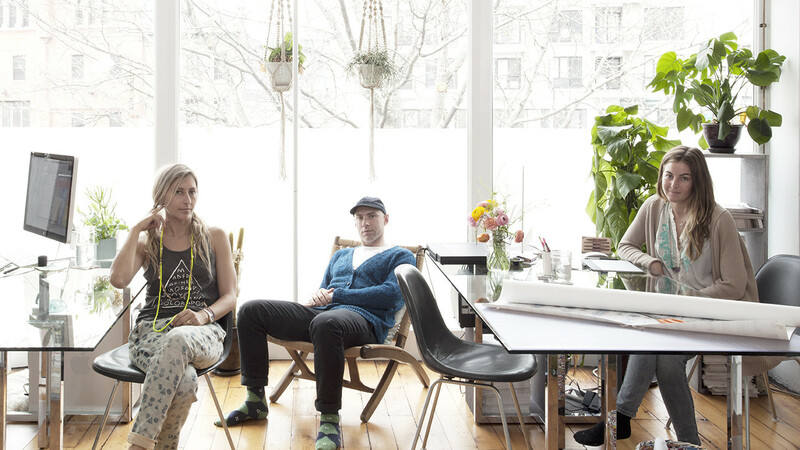 The husband-and-wife team behind Eskayel in their Williamsburg, Brooklyn, home office. From left: Shanan Campanaro, Nick Chacona, and Briana White, the couple's assistant. 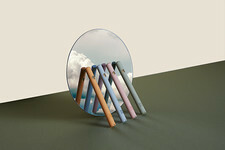 Campanaro works from a glass-topped dining table from CB2. Home may be where the heart is, but for Shanan Campanaro and Nick Chacona, it’s also where the art is. 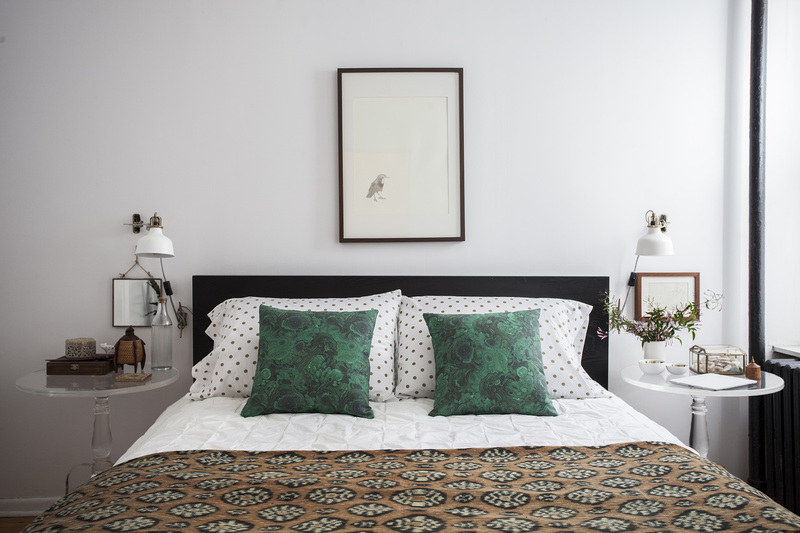 The husband-and-wife team behind the Brooklyn-based décor brand Eskayel have expanded Campanaro’s line of watercolor-like textiles, wallpapers, and accessories out of the bedroom of their Williamsburg, Brooklyn, apartment since 2008. But after nearly six years of efficient living, it became apparent that the couple had outgrown their space. Click here to see more photos. 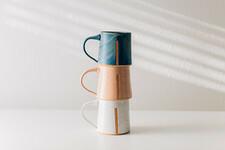 Inspired by Native American tribal weaving and Indonesian batik, Campanaro's watercolor-like designs double as decor items in the apartment's workspace. 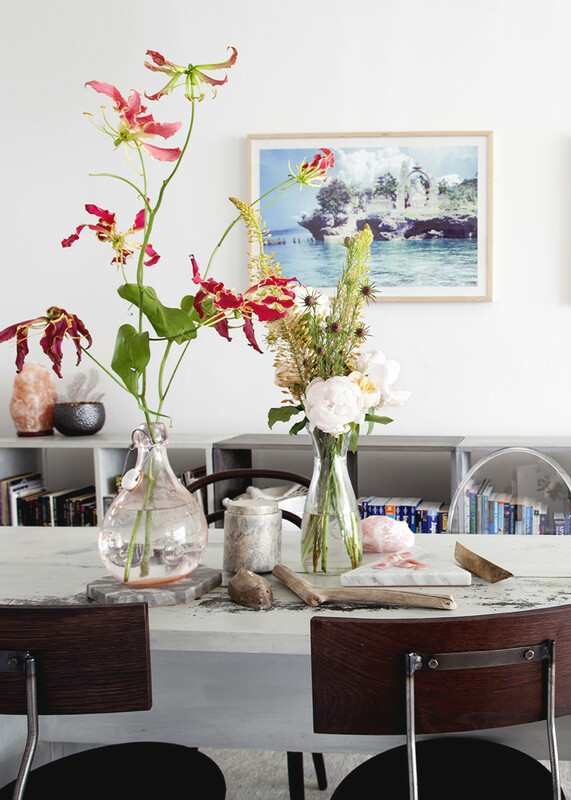 To keep the workspace feeling bright and open, she opted for glass-topped dining tables from CB2 in place of traditional office furniture and relied heavily on the fluidity of her designs to establish a boho-beach vibe that carries into the living spaces. 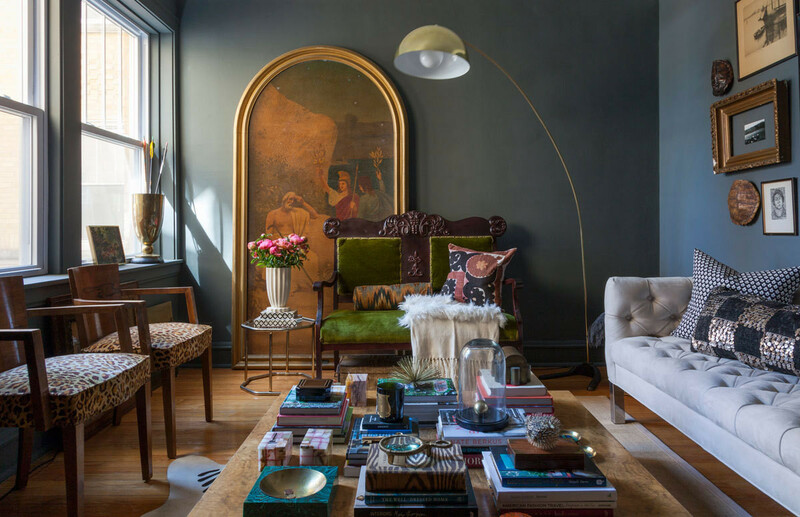 Eskayel-patterned pillows and rugs are strewn about, as are items from Campanaro and Chacona’s travels: tapestries from Indonesia and Belize hang on the walls; a Moroccan drum adds a worldly counterpoint to the couple’s collection of Midcentury pieces. But in a city surrounded by rivers that always seem to fade into the background, what’s most striking is the recurrent symbolism of water throughout. Everywhere there are references to the sea, a nod to both Campanaro’s childhood in San Diego and the dominant theme in her work. 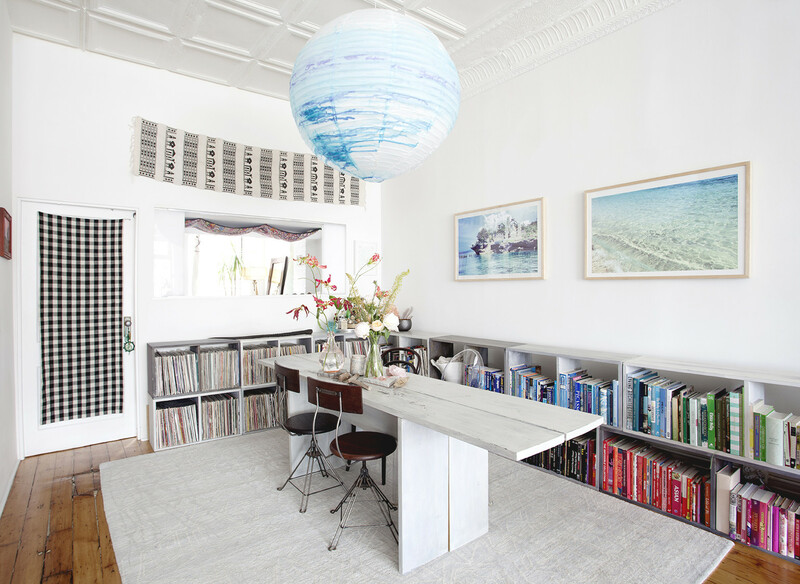 “I’m super inspired by water,” she says of the driftwood and surfboards and photographs of the ocean—taken during the couple’s honeymoon—that dot the space. “There’s something so calming about it; it’s almost like a meditation.” Now, the same is true of the place she calls work and home. Campanaro made the indigo-dyed paper lantern that hangs above the dining room table, which sits on Eskayel's Akimbo rug. Textiles collected in Indonesia and Belize and photographs taken during the couple's honeymoon decorate the walls nearby. A vignette on the dining table features carved wooden boats and driftwood, in keeping with Eskayel's water-themed designs. Campanaro and Chacona built the custom shelving that lines the space and coated them with gray milk paint. 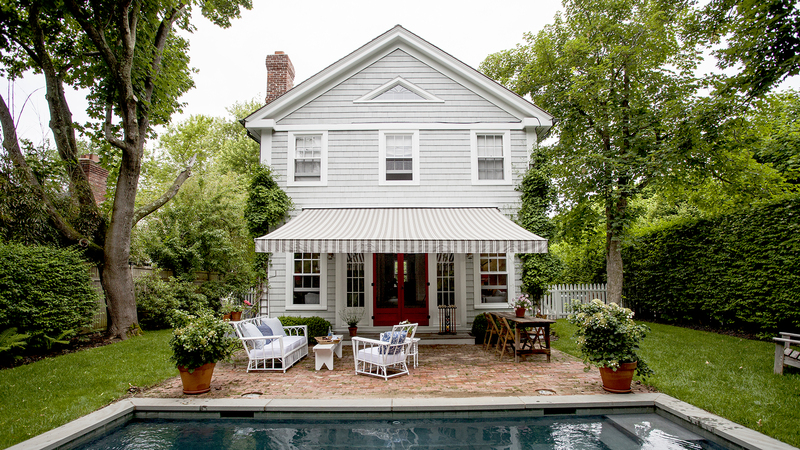 Interior designer Elizabeth Cooper creates a breezy summertime escape for Stella & Dot co-founder Blythe Harris. 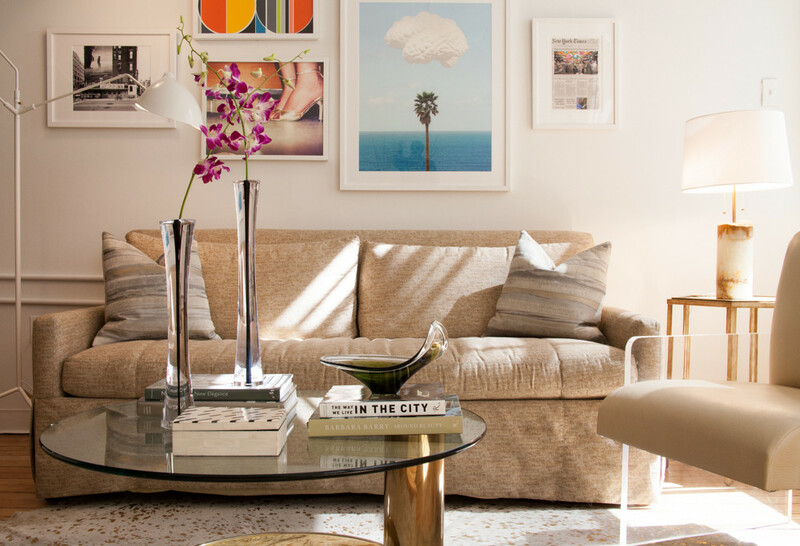 Decorating prodigy Matt Carollo translates his lifelong penchant for remarkable finds into a one-bedroom rental with old-world soul. 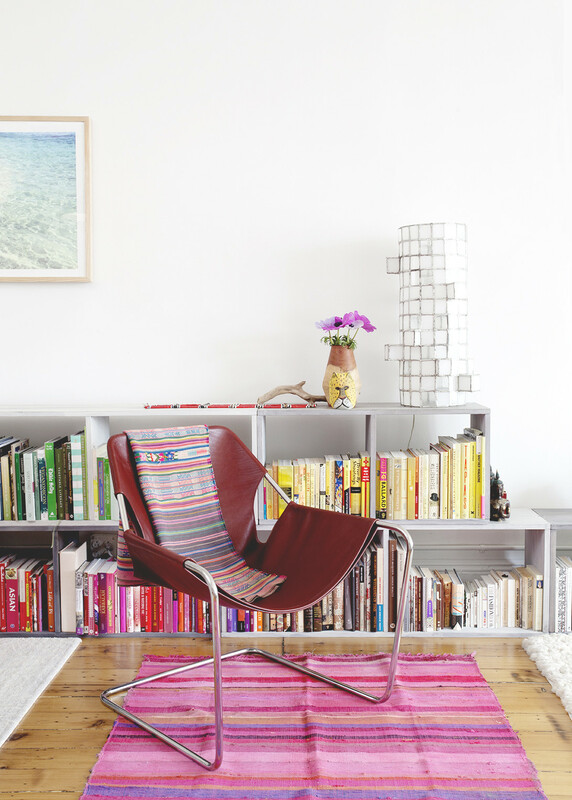 Furniture designer Katy Skelton's airy Crown Heights home is equal parts functional showroom and ultimate crash pad.